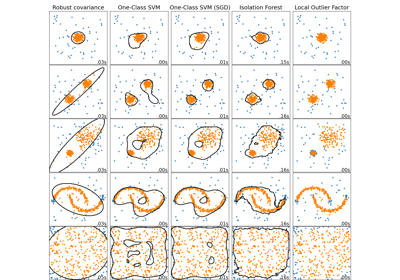 An object for detecting outliers in a Gaussian distributed dataset. If True, the support of robust location and covariance estimates is computed, and a covariance estimate is recomputed from it, without centering the data. Useful to work with data whose mean is significantly equal to zero but is not exactly zero. If False, the robust location and covariance are directly computed with the FastMCD algorithm without additional treatment. The proportion of points to be included in the support of the raw MCD estimate. If None, the minimum value of support_fraction will be used within the algorithm: [n_sample + n_features + 1] / 2. The amount of contamination of the data set, i.e. the proportion of outliers in the data set. A mask of the observations that have been used to compute the robust estimates of location and shape. Offset used to define the decision function from the raw scores. We have the relation: decision_function = score_samples - offset_. The offset depends on the contamination parameter and is defined in such a way we obtain the expected number of outliers (samples with decision function < 0) in training. Outlier detection from covariance estimation may break or not perform well in high-dimensional settings. In particular, one will always take care to work with n_samples > n_features ** 2.
correct_covariance(self, data) Apply a correction to raw Minimum Covariance Determinant estimates. decision_function(self, X[, raw_values]) Compute the decision function of the given observations. fit(self, X[, y]) Fit the EllipticEnvelope model. predict(self, X) Predict the labels (1 inlier, -1 outlier) of X according to the fitted model. reweight_covariance(self, data) Re-weight raw Minimum Covariance Determinant estimates. score_samples(self, X) Compute the negative Mahalanobis distances. Apply a correction to raw Minimum Covariance Determinant estimates. Correction using the empirical correction factor suggested by Rousseeuw and Van Driessen in [RVD]. The data matrix, with p features and n samples. The data set must be the one which was used to compute the raw estimates. Compute the decision function of the given observations. Whether or not to consider raw Mahalanobis distances as the decision function. Must be False (default) for compatibility with the others outlier detection tools. Deprecated since version 0.20: raw_values has been deprecated in 0.20 and will be removed in 0.22. Decision function of the samples. It is equal to the shifted Mahalanobis distances. The threshold for being an outlier is 0, which ensures a compatibility with other outlier detection algorithms. X : numpy array or sparse matrix, shape (n_samples, n_features). Predict the labels (1 inlier, -1 outlier) of X according to the fitted model. Re-weight raw Minimum Covariance Determinant estimates. Re-weight observations using Rousseeuw’s method (equivalent to deleting outlying observations from the data set before computing location and covariance estimates) described in [RVDriessen]. A mask of the observations that have been used to compute the re-weighted robust location and covariance estimates. Compute the negative Mahalanobis distances. Opposite of the Mahalanobis distances.